As a child of the 1970s and 80s, I grew up with lots of great, classic toys that I have fond memories of: Hasbro's ride-on Inchworm, Sears Kombi Kitchen, and Big Wheel to name a few. But there's one toy that I look back on and still shake my head over, and that's the Sit 'n Spin. Really, what was the point of this toy? Playskool (the current manufacturer) states on its site that the toy "encourages balance and coordination." Are they pulling my leg? Because all it ever did for me was make me incredibly dizzy, nauseous, and would sometimes give me a headache. You couldn't use it for more than a minute at a time because any longer would give you those previously mentioned symptoms plus make you want to pass out. As a result, even at my tender age, I knew better enough after a few times not to use it anymore. It wasn't long before I soon saw it being discarded into a garbage bag and taken to the end of our driveway. I know, I know, I know...I'm sure some Sit 'n Spin fanatic out there right now is exclaiming to him or herself, "Is she crazy?!? Who didn't love this toy, and throwing up all over mom's shag carpet after using it?" The toy was invented in 1973 for Kenner and is still being manufactured, which means it has existed for 41 years now. That means there's a demand for it--perhaps composed of sadistic parents who encourage their toddlers to knock themselves out using it. The Sit 'n Spin is even more pointless in my opinion than Romper Stompers--those clippity-cloppity buckets made famous by Romper Room that you would stand up on and attempt to walk around in. I bashed them several years ago on this blog, which pissed off at least one Romper Stomper fan. But c'mon, using Romper Stompers while attempting to go down a flight of stairs was a recipe for disaster and a trip to the ER. Of course, what makes the Sit 'n Spin name all the more amusing to me today is its adult definition. Didn't Mimi on The Drew Carey Show often tell Drew to "sit on it and spin"? (If not, I'm sure I heard it on some sitcom on a regular basis.) I feel like repeating the phrase to whomever thinks the toy "encourages balance and coordination." I can appreciate the simplistic nature of the toy (sitting on the plastic bottom disk and spinning yourself around using the top one) and the fact that it is not technology-based. That's as far as my personal love for it can go. But today's kids must enjoy it or they wouldn't still be making it. I am alone in my opinion? 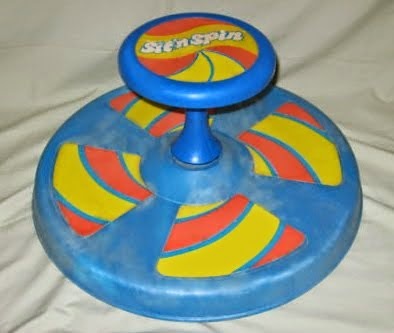 Did any of my readers have and absolutely adore the Sit 'n Spin? As the mother of 3 boys (now 6,10, &13) who would twirl themselves around in my living room until they got so dizzy they fell down, I loved the Sit'n Spin because it kept them away from sharp corners and the coffee table when they were indulging in their spinning. Seriously, I was going to put bike helmets on 'em until I saw a sit'n spin at a garage sale for 50 cents. I'm with you on this one, Pam. I don't enjoy rides of any kind that affect my equilibrium. My nephew, when he was little, would play on one of these all day if you let him, laughing his head off as he fell all over the place. I liked the Sit n Spin, but I really liked being dizzy. You could make yourself dizzier by starting at the spiral on the top. I later went on to invent a game where four 16 year old kids would go to the park after dark and ride the merry-go-round whilst facing out. Whoever threw up first lost. I was champion and I give all credit to my Sit n Spin training. If you ever wanted to make your child look like a total dweeb, this was the toy to do the trick. Lordy, I'm loving this blog. 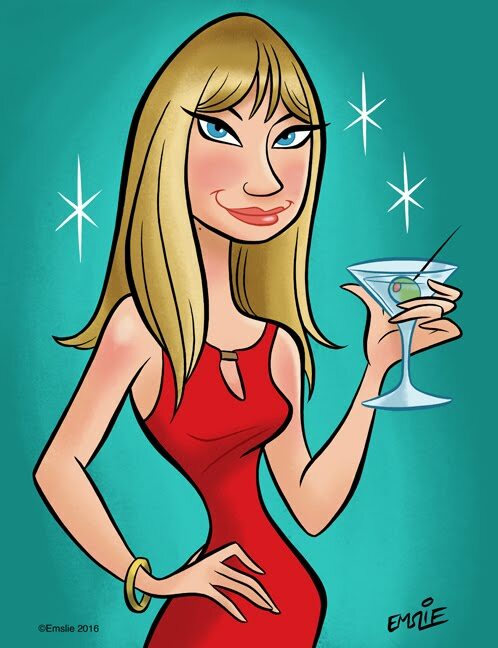 Ha ha just found this blog and I'm loving it. My kids never had a sit and spin but I'm guessing the attraction is similar to those spinning cup rides at the amusement park. Some of us love going so fast we fall over sideways in the cup laughing. Others are hurling their lunch! To each his own...it's what make the world go round (pun intended). I remember having this exact same one when I was little & I am currently looking for this one for 2 boys I am babysitting a 2yr old & 7yr old.